Reduce condensation on the Conical Fermenter caused by low fermentation temperatures. Made from high quality 5mm thick SBR foam. 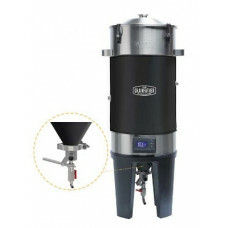 Contains two separate removable pieces for the fermenter body and the conical cone. This is included with the Glycol Chiller. If you have more than one Conical Fermenter you want to hook up to the Glycol Chiller, you will need an extra Cooling Connection Kit. The Grainfather Conical Fermenter Pro Edition includes the basic unit plus the Dual Valve Tap and Temperature Controller. 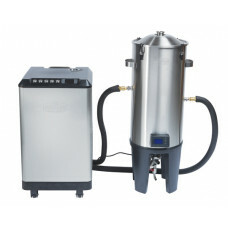 Allowing you to control the heating of your unit (and cooling with the Glycol Chiller available separately), dump yeast, take samples and transfer your wort via our innovative dual function valve design. The Grainfather Conical Fermenter Pro Edition includes the basic unit plus the Dual Valve Tap and Temperature Controller. Allowing you to control the heating of your unit, dump yeast, take samples and transfer your wort via our innovative dual function valve design. This is a replacement seal for the Conical Fermenter cone plug. 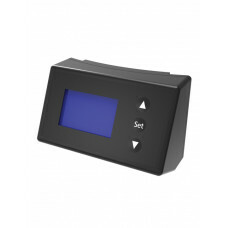 The Grainfather digital Temperature Controller replaces the temperature display. With this you can control the heating and the cooling (if you have the Grainfather Glycol Chiller) of your fermenter by dialling in a temperature or even setting a temperature schedule (can set up to 5 stages). This snaps on easily via magnets and pogo pins with no extra cords or clutter. WHAT’S INCLUDED? · Profile steps are set to ‘auto proceed’ by default, when setting up your own profile with steps the choice of ‘manual proceed’ (i.e. having to push a button to move to the next step) will only be available to select when the user changes the setting ‘auto proceed’ to off. Each step can then be selected as either auto proceed or manual proceed, depending on the users choice. 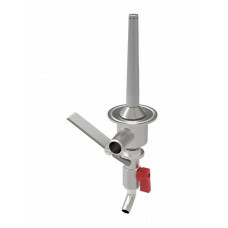 Make the yeast dumping, transferring and sampling process more professional with this innovative all in one valve. Sampling and transferring is done through a valve above the sediment line, allowing for clear, sediment free beer. Collect your yeast from below the sediment line for recultivating and pitching. This longer version of the standard Conical Fermenter Dual Valve inlet provides increased clearance above the sediment line for clear, sediment free sampling and racking of your beer.